First off I really apologize for being absent for so long. Thanks to everyone who has emailed asking if I'm ok. As I explained we had a VERY busy May and June. We remodeled three rooms in our home, planned a graduation party, had family in for graduation, attended graduation, and went on a wonderful vacation (I'll post more on that later). Once we returned, we faced the task of starting to move back into our office and my stamp studio area. Neither are complete so I won't post photos yet, but will share once it's completely done. The reason it's not done is because I looked at the calendar and realized that I HAD to start making my convention swaps. I signed up for WAY to many orgainzed swaps this year but they all sounded so wonderful, how could I not? My husband and son swear I need a 12 step program for swapping. They kid me every evening about going to my Swapaholics meetings. 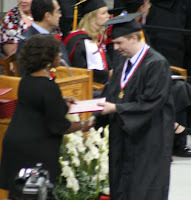 Let me just share a few pictures of my son on graduation day and then I'll start posting some other things. I have to say, we are very proud of our son. 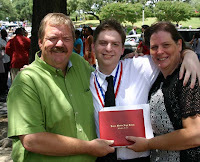 It was a long road and a struggle for a child with multiple learning disabilities but he graduated from one of the toughest high schools in our area. I'd also like to report that he's registered for classes in the fall at our junior college. So for those of you out the re with children that have LD's keep the faith, it can be done!! 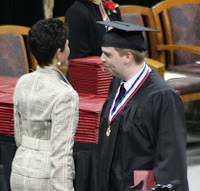 Left, Cameron getting his diploma from his assistant principal who was such a jewel his four years in high school. Right, after shaking hands with his principal we could see him say something to her, then she laughed, and he started smiling (thus being able to see his dimple in his cheek). We asked him what he said to her and he said, "I told her to enjoy her retirement."